"...Developed by AT&T, the ST connector (for Straight Tip) has been a perennial favorite for its termination simplicity and low cost." "...A small form factor ceramic based connector developed by Lucent." "...Originally developed by NTT, the SC connector has a push/pull snap fit. The duplex SC connector uses the same mating profile as the simplex design." "...This connector is radically different than the other connectors shown, in large part, due to the single ferrule that handles two fibers. " 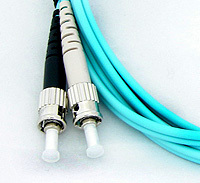 The Chameleon Patch Cable System is designed specifically to interface with the Chameleon High Volume Cassette Module. 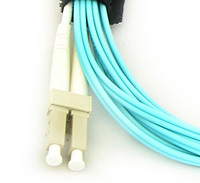 The system consists of 2 different color coded 24 fiber MTP brand– LC patch cables. 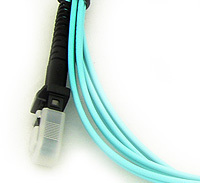 The patent pending patch cable design eliminates the chance of crosstalk at the 72 fiber connection point in the cassette. 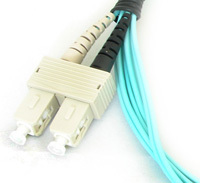 Featuring a low profile 24 fiber Siamese design along with LC UniBoot connectors, the Chameleon Patch Cable System saves critical space at the server or fiber manager fiber interface. MTP brand-LC Assembly, Sub Grouped Loose Tube Fiber, 24 Strand, 50/245 Micron, 10 Gig, (2) MTP to (24) LC, Plenum Rated, W/ 2 Foot Breakout on the MTP brand side and 3 foot breakout on the LC Side. "...The patent pending patch cable design eliminates the chance of crosstalk"
"...Featuring a low profile 24 fiber Siamese design"
"...the Chameleon Patch Cable System saves critical space at the server or fiber manager fiber interface."